Paul Avery specializes in high-energy physics and the study of elementary particles and the forces that govern them. <BR> <BR> Avery’s most recent research involves grid computing, in which computing and storage resources from around the world are linked together by high-speed networks to form a single, common computational resource that can be accessed from anywhere. He is the director of two international grid projects funded by the National Science Foundation (NSF). The first is called GriPhyN, which will research basic grid technologies, focusing on the needs of data intensive sciences. The second is the International Virtual Data Grid Laboratory (iVDGL), which is a worldwide grid laboratory that will provide large-scale resources for several experiments with massive computational and data needs. The iVDGL will form the world’s first true global grid, providing an integrated computational resource for major scientific experiments in physics, astronomy, biology and engineering. 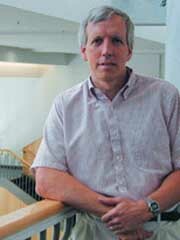 <BR> <BR> During the past year, Avery has authored or co-authored more than 25 papers related to his research. In 2000-2001, he was the John C. Slater Commemorative Term Professor for the College of Liberal Arts and Sciences.